Eco Disposable Diapers FREE Diaper Trial Packs Beaming Baby Bio-Degradable Diapers - Best Seller! 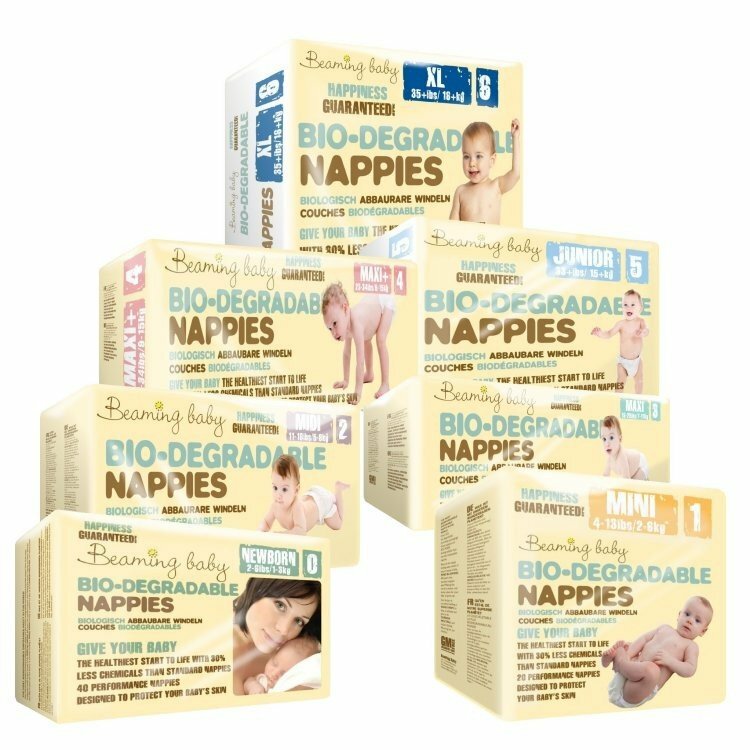 Eco Diapers Bulk Buy and Save! Eco Training Pants Beaming Baby Training Pants - Best Seller! Beaming Baby Bio-Degradable Diapers - Best Seller! Eco Diapers Bulk Buy and Save! 10% OFF Bio-Degradable Diapers SALE! Baby Wipes SALE! 10% OFF Bio-Degradable Diapers SALE! No Diaper Rash within 7 Days Guaranteed or your Money Back! Order Today - Buy 11 get One Free! The USA's Best Selling Organic Baby Wipes are designed for Your Baby's soft, sensitive skin. Made with Loads of Organic Aloe Vera, they will help to Heal and Soothe sore bottoms. Perfect for Your Baby's Face and Hands too! Order Today for Your Baby's Health and Happiness! Bulk Buy and Save: Buy 11 Get 1 Free! 98% of BABIES SUFFER from Diaper Rash, Eczema, Asthma or Sensitive Skin Problems in their first three years of life. Many of these problems can be easily solved by avoiding the HARSH CHEMICALS that the BIG CORPORATIONS insist on putting into standard baby products. Beaming Baby have stripped out these chemicals to ensure that YOUR BABY only comes into contact with the most gentle, natural and organic ingredients. WHY WILL MY BABY BE HEALTHIER? HOW WILL MY BABY BE HAPPIER? Made with loads of ORGANIC ALOE VERA, these baby wipes will help to SOOTHE Diaper Rash and Sensitive Skin, They will help to protect your baby’s delicate areas from dampness and give your baby naturally healthy skin. With less Diaper Rash and Healthier Skin, your baby will feel much HAPPIER! You can rest assured that you are giving your baby the HAPPIEST start to life. In addition, because these wipes are 100% bio-degradable, your baby will grow up in a better, cleaner world! We GUARANTEE that YOUR BABY will be HEALTHIER and HAPPIER with Beaming Baby Essentials than any other baby brand. If you and your baby are not TOTALLY HAPPY with any Beaming Baby Product, just call or email us for an immediate no quibble credit or refund. We’ll even collect any unopened products entirely FREE OF CHARGE! To find out more call our FREE helpline or read more on this page. 50% Chalk packaging, half the Carbon Footprint of other wipes! Bio-Degradable Wipes Cloth disappears within 2 years, instead of the crazy two hundred years that Standard Polyester Baby Wipes take. Certified Organic Lotion means Sustainably Grown ingredients with No Herbicides or Pesticides used - of course it's so much better for our beautiful Planet. By Buying these Organic Baby Wipes, you are helping the environment for Your Baby. Certified Organic: Our lotion contains over 95% organic ingredients and are certified by the Organic Food Federation. Soft and Gentle on Your Baby's Skin: The highest quality ingredients mean our organic baby wipes are incredibly soft and gentle on baby’s skin. 30 Times More Aloe Vera than Any other Baby Wipes: Each pack contains over 90mls of Organic Aloe Vera (30 times more than any other wipe! ), which heals, moisturises and nourishes sensitive skin. Free from all Harsh Chemicals: Free from Chlorine, alcohol, paraben preservatives and sodium laureth sulphate, we use only the most Pure, Natural and Organic Ingredients available. Easy to Use Pop Up Packs: Our natural baby wipes are in a resealable pack, and the fold makes it really easy to pull them out - the next wipe pops up ready for use! Baby Gentle Lotion: Not just for bottoms, handy for faces and sticky fingers too. Have you tried our Bio-Degradable Diapers? Have you tried our Bio Degradable Diaper Sacks? 100% Bio-degradable: Beaming Baby's Certified Organic Baby Wipes are Totally Chlorine Free and Bio-degrade in normal waste disposal conditions over one to two years. Do not flush when a macerator or narrow waste pipe is in use. Sustainable forests: The wipes cloth is made from Certified "Sustainably Managed" forests in Europe. Aloe Vera is ideal for babies with eczema and sensitive skin. Vegan Society approved. Not tested on animals. Delivery to your Work Address - no problem! Please call us free on 213 325 6311 with any specific delivery requirements, we will do our very best to give You and Your Baby the best possible service! We also offer Free Returns and Full Refunds on Returned Products. In the unlikely event of an item being temporarily unavailable, we will contact you straight away. We will normally send the first part of your order immediately and inform you of the expected delay on the remaining item(s). As a small family run business we will do all we can to get your order out on time, however during periods of really high demand there may be a slight delay. Please call us free on 213 325 6311 or email us (orders@beamingbaby.com) if your order is urgent. We Guarantee that You and Your Baby will be Healthier and Happier with Beaming Baby Essentials than any other baby brand. Or Your Money Back! 365 Day Money Back Guarantee! If you are not 100% HAPPY with anything from Beaming Baby, just call or email us for an immediate, no quibble refund. We don't want you to worry about anything at this really exciting time in your life. So if anything doesn't work out quite as expected, just give us a call and we'll sort it out immediately, we'd love to hear from you. I wouldn't use any other wipes on my babies skin. So many other competitors wipes are FULL of unnecessary artificial ingredients. My baby has never suffered any skin irritation or diaper rash thanks to these wipes. My baby is a beaming baby! Fantastic wipes, lovely and soft and don't irritate my daughters bottome like most wipes. Will be buying many more in the future. Thanks. My son has eczema, which we realised was aggrovated by all 'main brand' wipes, even the sensitive varieties. I came across these wipes while searching the net for a solution and I have not been disappointed! They clean brilliantly and do not cause his eczema any problems. I highly recommend them!!! Fab wipes that clean effectively yet don't dry delicate skin. Perfect for when you're out and about and don't have water to hand. Great for dirty bottoms and grubby hands - everything cleans-up brilliantly. Lovely, gentle wipes. I love the scent (it's very subtle and natural) and they feel pure and good for my baby's skin. And they're biodegradable! Win win! I love these wipes. I don't just use them for my baby, but on me too. They don't leave you feeling dry like other wipes, but have such a lovely soft, warm texture. Would recommend to everyone. Wonderful wipes! Nice texture and very soft. Would definitely recommend them! Best wipes I've come across so far! Brilliant product!!! My son has never had diaper rash and I am sure that is down to using this product!!! Beautiful texture - not greasy, just soft! Only brand I will use for little one! Lovely wipes, even with a sore bottom, my little one does not cry! Excellent service, fast delivery and great quality products. Only brand I will use for little one! My teenage daughters use them too! Iv used beaming baby wipes and other organic/naturals since he was born. These are the best by far. I love how they have that velvety feel and one does all jobs. My teenage daughters have discovered them now ? So Il be needing more packs soon. Super efficient service! I stocked up this time so I didn't run out, but I know I'd ever I do, my order would be here quick sharp!? Need any of these too?